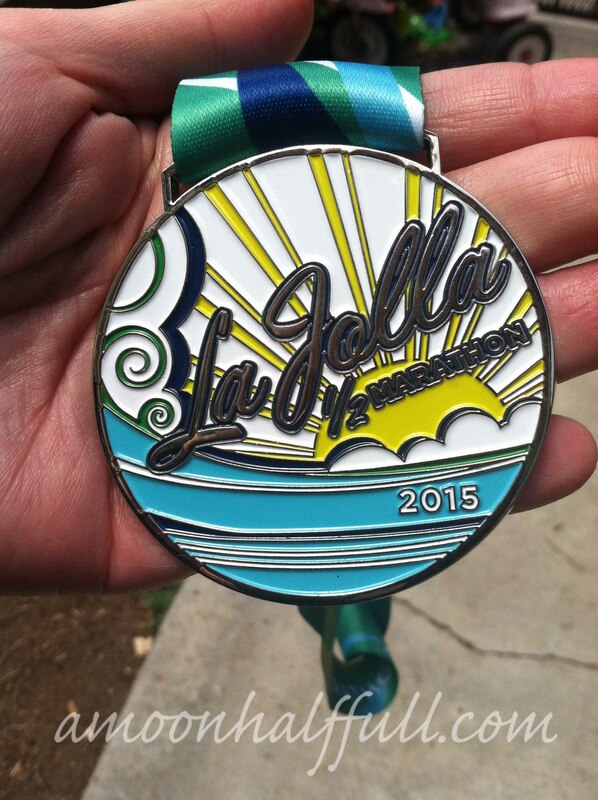 The La Jolla Half Marathon, the second race in the San Diego Triple-Crown series. This race starts at the Del Mar Race Track and ends at La Jolla Cove. You have the option of parking in Del Mar or parking in La Jolla and taking a bus over to the start. I had heard this was the ideal way so you wouldn’t have to wait and prolong the day to catch the shuttle back to the race track. Besides, I am a slower runner and wanted to be able to take advantage of the beer garden without worrying about missing the shuttle back to my car. I arrived in La Jolla and parked in the cove by 4:30am. I encountered very little traffic and I was able to park very close to the staging area for the finish line. I got out of my car. It was dark and I could hear the waves crashing. I immediately thought about how amazing it is to get to live in this city and that this day was going to be wonderful. I headed over to the bus line and I was able to get right on. An older gentleman sat next to me and we had a nice chat. We arrived at the Del Mar Race Track at around 5:15 or 5:30 am. Only thing to do was wait. The race didn’t start until 7:30am. Luckily, there was a cart in the parking lot selling coffee. I made my way there and bought a cup. I then found a wall to sit on. At one point, a man came over and sat next to me. He introduced himself as my 1:30 pacer. Ha, that’s not me but thanks for thinking it would even be a possibility. We had a nice chat about runner and race stuff. Nice thing about the set up at the race track is the open bathrooms with running water. The race provided plenty of porta-potties but I was closer to the bathrooms with indoor plumbing and for a while it seemed like they were mine and a few other runner’s secret. Finally it was time to start. I ended up in the very last corral which was totally right, sigh. Race was on. – Beautiful course. Seriously! I love the point to point courses and this one is stunning. – Taiko drummers just before the ascent up Torrey Pines. – Plenty of on course support. They had lots of water and large “water monsters” available so that runners could refill their own hydration packs. – This race and the participants had a great vibe. – Great beer garden with free beer for participants. I loved that this year was sponsored by Ballast Point, a local San Diego brewery. It only makes sense since San Diego is a craft beer paradise. This touch made the race extra special. Again, I had a nice chat with some other runners, this time over a beer. Excellent! – Beautiful medal. I love my shiny mementos. – The packet pick-up was at Road Runner Sports. The parking lot was CRAZY and the whole expo experience felt very frenzied and congested. I couldn’t wait to get out of there. Over all this was a GREAT race. It is a local race I could see myself doing again in the near future. The course is beautiful and the time of year, Spring, is perfect. I recommend this race for any San Diego runners or anyone else who wants a runcation.